Stress has been shown to be either a cause or a factor in up to 90% of all disease. Unmanaged, it can literally destroy every aspect of your life! Stress itself is an unavoidable part of life that comes at you daily. But you can learn to avoid distress – which is the excess amount of stress over and above that which you are adequately managing or handling well. 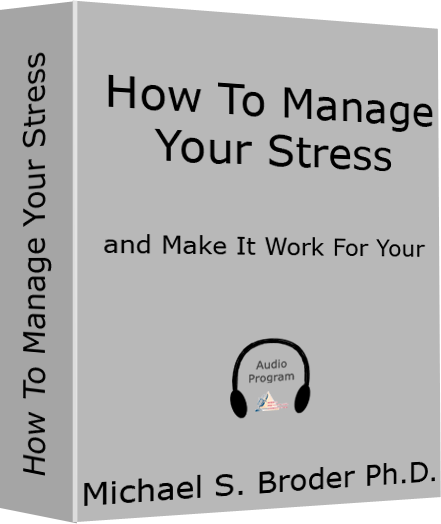 In this audiotherapy program, Dr. Broder provides you with all the tools necessary to carefully identify your stressors and then to develop strategies for managing each one. You will learn how to turn all that inevitable stress of daily life into positive motivators! And once you do, stress will permanently stop being a destructive factor to your career, your relationships, and your health! Dr. Broder walks you through 15 proven techniques and exercises to help you arrive at that destiny you have chosen with all the necessary action steps. How to recognize stress-producing attitudes and behavior, how to avoid their pitfalls and dangers, and how to bring about rapid changes in your life’s destructive factors. This powerful and highly acclaimed audiotherapy self help program in MP-3, CD or cassette format is used by people around the world to handle everyday stress, as well as to learn more about chronic stress, stress management, and the overall effects of stress on you. It then helps you manage your stress and learn to avoid distress which is the excess amount of stress that exceeds what you are are managing. How to Manage Your Stress is also used, recommended and highly endorsed by therapists, life coaches, physicians and other professionals everywhere to help clients/patients recognize the signs of stress and dangers of distress which can impact your physical health as well as your mental health in many ways. The audio program contains numerous exercises and proven strategies for stress inoculation, stress relief, accessing your relaxation response anytime or anywhere, attacking the causes of your stress and changing the stressful attitudes that cause stress and distress to negatively impact your life.